Your Marketing Mentor gives you all the tools, resources and support you’ll need to make your club’s marketing more productive, more effective and importantly, more profitable. 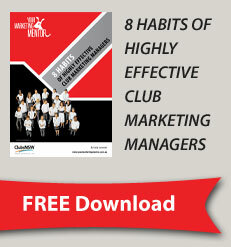 This ‘Roadmap to Club Marketing’ provides step-by-step guidelines on how to maximise each area of business; practical examples; relevant, up-to-the-minute news and tips; individual support; contacts and links for any resource you’ll require – in fact, all you’ll need to succeed with your club’s marketing. Your Marketing Mentor shows you the” why”, the “how to” and all the practical and tactical things you can do to make marketing work for your club. Best of all, it’s accessible and affordable for any club, no matter the size of the venue or your marketing experience. Click on the numbered boxes below to find out more! © Copyright 2012 Your Marketing Mentor . All rights reserved.